Driving up and seeing this was a mega thrill! Book Week has always been a red-letter week for me. Sadly, there was no such literary celebration when I was growing up in the 60s, but my children were luckier – books were finally being celebrated in schools – and I couldn’t be happier! 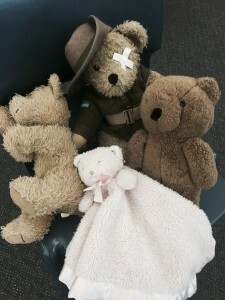 I remember the excitement building as the kids plotted and planned their costumes for the much-anticipated Book Week parade! The fabulous characters who paraded the playground while proud mums and dads clicked away on their cameras. I remember being very impressed by a fabulous Pippi Longstocking, whose clever mum had “wired” her plaits so they stuck straight out from her head! I gasped with astonishment when The Wardrobe from C.S. Lewis’ imagination strutted her stuff (and deservedly took out First Prize) and I recall grinning like Lewis Carroll’s Cheshire Cat when my daughter rated a Highly Commended for her Pirate Queen – swashbuckling boots, sword ‘n’ all! 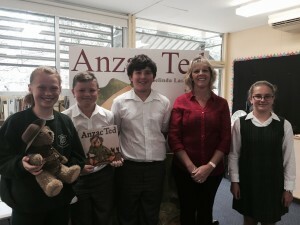 Every year Book Week has been special for me – and this year even more so. 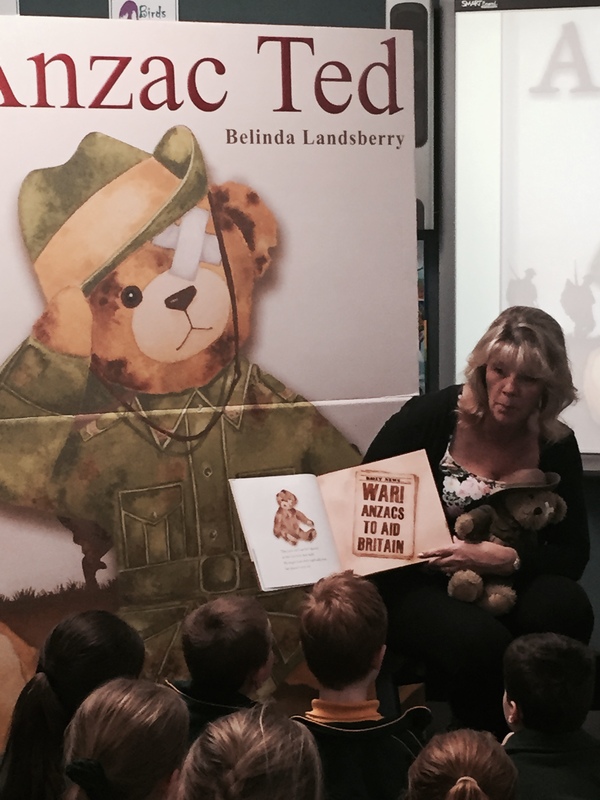 This year saw my debut picture book, Anzac Ted, rubbing spines with some of the world’s most celebrated titles. I walked into five different schools this week; and every school had my book on its library shelves; it was a very special moment. Added to this was that I’d been asked to appear as guest author/illustrator, so by week’s end I’d met hundreds of children and dozens of teachers and books had connected us all. One of the highlights for me was returning to my old primary school, Normanhurst West, which I attended from 1966 – 1972. During my dash down memory lane I pointed out classrooms where I’d chanted times tables and trod the very same asphalt where I had learned the joys of progressive dancing under the sweltering Aussie sun. I meandered past the old tuck shop where I’d occasionally experienced the heady heights of ordering my lunch: a hot meat pie dolloped with tomato sauce in a paper bag! I scuttled past the principal’s office which had echoed with the thwack of the cane in the 60s and 70s. And I told today’s generation about the virtues of “signing up to drink milk” which was a double-edged sword! Mostly it was cold, creamy and delicious, but since it was delivered in open crates and unrefrigerated, winter meant that your chilled fingers froze into a claw-like grip on the bottle. Added to that was the unhappy fact that summer had the tendency to morph the milk into yoghurt – but hey, we’d signed on the dotted line, so we were pledged to drink the stuff, regardless! 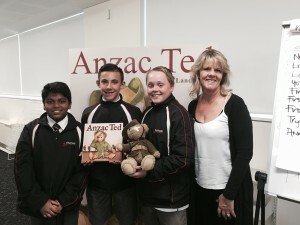 The kids at Brooklyn Public School brought in their own teddies – how sweet! All in all it was a whirlwind week of words, pictures, smiles and laughter. I read my book, painted Anzac Ted “live” and ran workshops for budding young writers and illustrators. Perhaps most rewarding was when children approached me, some quite shyly, to tell me they had been inspired to write their own stories now. So thank you to the wonderful students, teachers and parents from Normanhurst West, Riverbank, Cowan and Brooklyn Public Schools as well as The Ponds High School. I hope, like me, you had the best Book Week ever! 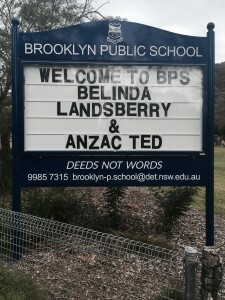 This entry was posted in Anzac Ted, Author Visits, Books and tagged Anzac Ted, Book Week, Brooklyn Public School, Cowan Public School, Normanhurst West Public School, Riverbank Public School, The Ponds High School on 2 September, 2015 by belinda.